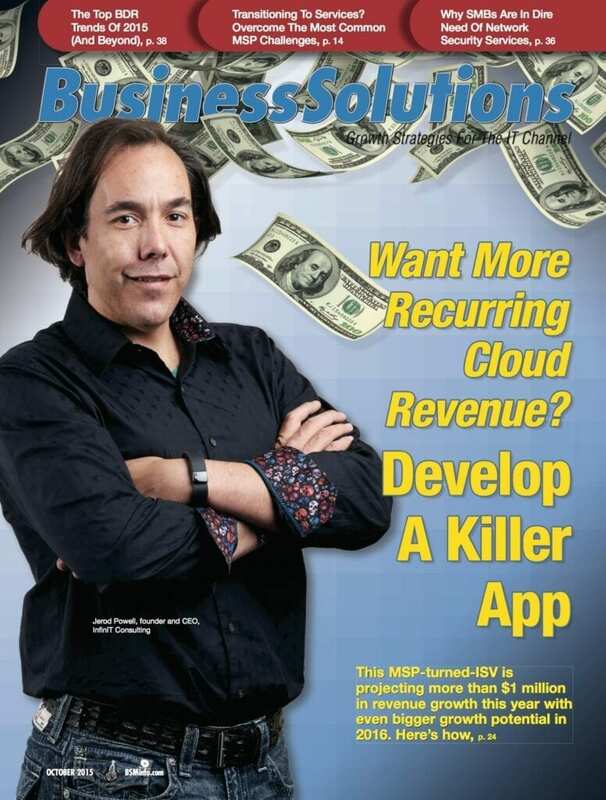 Want Recurring Cloud Revenue? Develop A Killer App. This small MSP-turned-ISV is projecting more than $1 million in revenue growth this year with even bigger growth potential the following year. Jerod Powell understands managed services. He knows, for example, that it is not about selling SharePoint subscriptions or disaster recovery as a service (DRaaS) — it is about selling a business transformation service. While that mindset is enough to put Powell’s company, INFINIT Consulting, in the minority of managed services providers (MSPs), there is something else equally important this CEO has learned. If you want to differentiate your business from other channel companies reselling IT solutions and services, you need to develop and sell customized, cloud-based software. A look at the 1 million-plus applications available at the Android and Apple app stores is proof that lots of app developers want a piece of this lucrative and highly-competitive market. “Early on I had to contend with the recurring thought, ‘What happens if I invest all this time and money developing the perfect program and no one wants to buy it?’” says Powell. Another fear was what if he came out with a great app that businesses did want but one of his competitors stole his idea by copying the backend code. “Aside from the GUI [graphical user interface], it’s difficult to protect against someone from copying the code,” he says. Powell had enough data points to realize that the first fear was just the normal feeling that comes with taking risks and trying something new. To protect his company from piracy, however, he met with multiple intellectual property and patent attorneys and adopted a nondisclosure agreement [NDA], which provides at least some protection. Once the above-mentioned fears were addressed, there was just one more issue that needed to be addressed, which was where was he going to find the right application developers to build his first killer app — and hopefully more apps after that. “The market moves quickly, especially when the cloud is involved, and I knew I had to move quickly or someone else was going to develop the same app before me,” says Powell. After discovering that hiring an application developer in the San Francisco Bay area wasn’t going to work (thanks to the myriad of other tech companies in Silicon Valley), Powell knew he needed to find outsourced talent. “I knew I wanted developers with .NET and C-sharp programming skills, preferably with extensive REST (representational state transfer) API (application program interface) experience and ideally some expertise with Cortana Advanced Analytics, Microsoft’s machine learning language, which is designed for big data and IoT [Internet of Things] apps,” he says. Powell is planning to make his company’s cloud management software available in a multitenant version for channel partners. Additionally, INFINIT Consulting is developing modules that will roll in other Microsoft products such as SharePoint, Skype for Business, and Azure Active Directory (AD). Jerod Powell, founder and CEO of managed services provider (MSP)-turned-independent software vendor (ISV) INFINIT Consulting, describes the past year of business as a whirlwind. After recognizing a common problem among large organizations setting up shared contacts in Office 365, he developed a cloud-based app to address the problem. Since launching his killer app, Powell’s business has been disrupted in every way, leaving him little time for sleep. One redeeming quality he has appreciated during this tumultuous time is his relationship with business partner, Ingram Micro.